Alright back to the drawing board "Where can I get a few Billion to build MY WALL????" Who is that guy that runs Caaannaada????? You're showing your ignorance of the process. First, it's a normal conflict of the separation of powers of co-equal branches of government. This version is political theater. Second, next comes the president's veto. Third, the bulk of the wall funds have very little to do with the emergency declaration. The irony of it all is that the Congress can pass something to STOP TRUMP from fixing the issues on the Southern border, but they can't pass legislation to fix the issue themselves OR rewrite the law that gives POTUS the power to declare emergencies. Trump is acting within powers granted to him by Congress, but BECAUSE TRUMP, some want to change the rules. So change them. But they can't. They can only come together to STOP TRUMP. Republican Senator Mike Lee offered legislation to rewrite the law limiting any POTUS' power on emergency declarations. Democrats said they wouldn't vote to change it. BECAUSE TRUMP. The wall is being built and will continue to be built. A movement is underway of Jews leaving the Democrat party, where more than half have voted in lockstep for decades. "Republicans are waiting with open arms. Remember Jerusalem (U.S. Embassy) and the horrible Iran Nuclear Deal!" Trump and other Republicans have hammered Democrats over alleged anti-Semitism in their ranks in the weeks following controversial comments made by freshman Rep. Ilhan Omar (D-Minn.), who questioned the U.S. relationship with Israel repeatedly in ways that some said were steeped in anti-Semitic tropes. Omar has apologized for her rhetoric and vowed to do better to avoid language with historical connotations about Jews, while the House voted to pass a nondescript resolution condemning all forms of hatred that had initially targeted solely anti-Semitism and her comments. Some Republicans refused to vote for the resolution, accusing Democrats of backing down from a stronger specific condemnation of Omar's remarks. Trump himself has accused Democrats of being "anti-Jewish" in public comments and reportedly said that members of the party "hate" Jews during a fundraiser last weekend. If Black Americans and Jews continue to leave the Democrats -- even a small percentage -- it will become more and more difficult for Democrats to win national elections. The Democrats are very aware of this, and it is why they work so hard to open US borders to illegals, fight hammer and sickle against voter ID and want 16 year-olds to vote. Their voter base of adult Americans is dwindling. What happens if you are a Black Jew do you get 2 votes?? Founder, Candace Owens, tells it! Dinesh D'Souza lays out the history of the Democrat party at BLEXIT. Trump trumps the LIBs in NY -- both Oc-Co Loco and NYC Mayor de Blasio. And by the way, De Blasio showed up in New Hampshire for a speech. Only 20 people showed up. A Gallup poll from last week showed Ocasio-Amazon Job Slayer has great name recognition nationwide, BUT ... the more she opens her mouth, the less people like her. The same Siena poll showed that a plurality of NYC folks see her as the destroyer of the Amazon jobs. Only 22% see her as any kind of "hero." Instead of some internal reflection, Oc-Co Loco blames Fox News for her negatives. Democrats losing elections and now want to change ALL the rules. You'd think Dems would have learned after making new rules -- like the Biden Rule, like Harry Reid going nuclear in the Senate and allowing easy confirmation of judges. When Dems lose, they want to change all the rules; and they had the nerve to claim that Trump wouldn't accept the vote of the 2016 election. So who's feelings are still hurt? Who isn't accepting the result? Not exactly where I would expect a Republican to appear in a chart of all Democrats in a Democrat state. I would have expected Trump's favorability on that chart to be dead last. 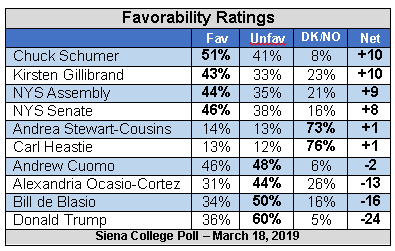 The fact that the nine others are all Dems and Trump ranks #6 in favorability in a chart of 10 Dems is pretty impressive. Even more impressive is that he passes the NYC Mayor, the popular and bubbly Oc-Co Loco and way ahead of two others. I'll take that any day of the week in NY. ie nothing has changed vis-a-visTrump since November 2016. I think you're trying to make a point that I'm not making.